When it comes to neighborhood life in Boston Beacon Hill, most people take a “live and let live” approach. Unfortunately, when it comes time to list your home for sale, what your neighbors are up to can put a dink in the real estate market value of your Beacon Hill home. Sometimes, the value reduction is justified — truly unsightly homes in the neighborhood, or a higher than normal level of noise activity. Usually, though, if a neighborhood is bringing down your Beacon Hill condo value, it’s because unsightly homes or unnecessary traffic are creating a perception problem. Here’s’ how to tell the difference, and what to do if your downtown Boston neighbors are a nuisance. Remember, value and price are two different things. Your Beacon Hill real estate agent will suggest a listing price for your home based on what other, similar Beacon Hill condominiums are selling for. However, buyers will take a look at your home and decide what the value is for them based on how they perceive the home, the neighborhood, and the quality of the investment they’re making. The price of your neighbors’ homes can affect your home’s price, simply because they’re most likely to be in the pool of “comparables”. Comparable homes are what your real estate agent will use to set the list price, and because the most important factor in real estate is location, neighborhood homes usually make up the bulk of comparables. Your neighbors can also affect your home value, or what buyers are willing to pay for your Beacon Hill home. That’s because buyers are not seeing your home in isolation — they’re seeing the whole neighborhood when they drive up, get out of the car, and check out the views from the home. No matter how well your home is priced for the Beacon Hill real estate market, these factors can alter potential buyers’ perception of its true value. 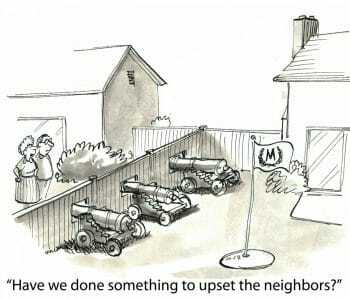 Fortunately, the law is on your side when it comes to having an orderly, quiet neighborhood. A while back, Mayor Walsh instituted a restriction and a permitting process for short-term vacation rentals offered through websites like AirBnb, but there are still hundreds of Boston Beacon Hill condo owners that are renting out rooms or there whole condo on short term basis. Boston Beacon Hill home buyers seldom express concerns about permitted, above-board short-term rentals happening in their potential neighborhood. What does worry them is excessive traffic, parties and illegal (not up to code) structures. This activity can make them feel like the neighborhood is less safe or quiet than it could be. Although short-term rental activity can be different from day to day, assume that if you’ve noticed disruptive activity at a neighbors’ house, there’s a chance that it’ll be happening when a potential buyer shows up with their real estate buyers agent to tour your home! Fortunately, the Boston short-term rental permit sets guidelines everything from parking, to the number of guests, to what additional structures on your neighbors’ property can be rented. In rainy Boston, vegetation is beautiful, strong — and a potential home-value ding. Plants and trees will grow right into your home if you let them! In addition, branches touching the sides of your home or rooftop can be a conduit for everything from spiders (harmless but terrifying) to carpenter ants (a potential home-wrecker). It’s easy to put off pruning trees when they grow from a neighbor’s property. However, once the branches cross the property line, they’re yours. It’s a good idea to let your neighbor know that you’ll be pruning the branches — especially if it’s been put off for a few years — but it’s not their job to care for the side of the tree that touches your house. If your neighbor simply has overgrown plants and trees that you believe are unsightly, you can always call in a code violation. Ditto for unmowed grass and weeds, dead trees, and any vegetation obstructing the public’s right of way (ie the sidewalk). 3. Too many vehicles, appliances, etc. According to Boston City Code, “All exterior property areas shall be maintained in a clean and sanitary condition, free from any accumulation of rubbish or garbage”. Upon request, the Bureau of Development Services also sends inspectors to discourage “the accumulation or storage of non-trash items such as appliances, building materials, furniture or other items not suited to outdoor use.” Vehicles parked on non-paved areas are also prohibited by code, and a disabled vehicle anywhere on the property can be a no-no. If you have an HOA they will have their own rules on top of the city’s. Remember, the perceived quality of your neighborhood is cumulative. If one neighbors’ place looks a little wild, that might not have an effect on home buyers. If all of your neighbors are racking up code violations, it could translate to up to a 10% loss in your home value, according to the Appraisal Institute. There’s no obligation to involve the City of Boston in your complaints. If you can brave it, knock on your neighbor’s door. It’s a good first step, and most people are considerate — it’s just that they’ve grown used to the mess. If this simple mediation doesn’t fix the problem, asking the city to send an inspector is a good next step (this is an anonymous process). Thinking about listing your Boston Beacon Hill condo in 2019? Call your Beacon Hill real estate team for a free, no-obligation analysis of your home’s current value, neighborhood included!